Contemporary Childrens Bedding - Beautifully designed bedding that makes little imaginations soar. Finely crafted from 100% cotton fabric for durability and ease of care. Skillfully finished using complementary prints and patterns, elabourate embroidery, and unique appliquis. 1 - Square Cushion - 18 x 18"
Add a piece of art to your home with this square, decorative shibori cushion. The tie-dyed print is very trendy. Comes in assorted prints of blue and grey, 18 inches x 18 inches. LJ Home Fashions decorative throw cushions is an easy and affordable way to change the look of any room. Jump in to today's hottest vintage decor trend with classic Chevron printed cushions by LJ Home Fashions. Classic chevron (geometric) print available in five (5) fabulous colours. Design is the same on both sides of the cushion. Home decor fabric has a denim like feel. 100% polyester. Set includes two (2) 18-in square cushions. 100% polyester hypoallergenic fill. Spot clean. Please note due to shipping, product will arrive in a slightly compressed state. Cushions will expand to final size listed in description. 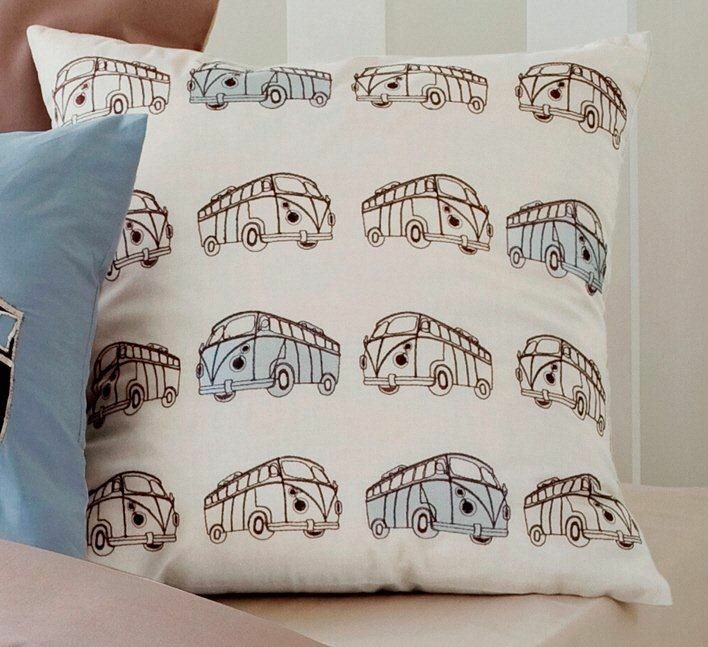 Combi Vans Square Cushion Contemporary Childrens Bedding - Beautifully designed bedding that makes little imaginations soar. Finely crafted from 100% cotton fabric for durability and ease of care. Skillfully finished using complementary prints and patterns, elabourate embroidery, and unique appliquis.